With the news that the forces of General Haftar have bombed Tripoli's Mitiga airport (8 April), the events in Libya have reached a critical stage. The conflict is not just about two men and their armed forces, General Haftar (former Gaddafi general, lived in USA for 20 years, warlord with military clout based in the east of Libya) and El Sarraj (head of the UN-backed nominal government, with little clout outside Tripoli). As the leaders of the EU countries on 27-29 June put their names to their “universal accord” on immigration policy, news arrived of another horrific tragedy off the coast of Libya. A hundred men, women, and children drowned as their rubber boat exploded and they drifted helplessly in waters where NGO rescue ships are now banned by Marco Minniti, Italy’s Minister of the Interior, not in the current right-wing Italian government, but in the previous centre-left one. Recent reports about the Libyan slave trade adds further to the horror of what is going on in Libya and across the south Mediterranean region. 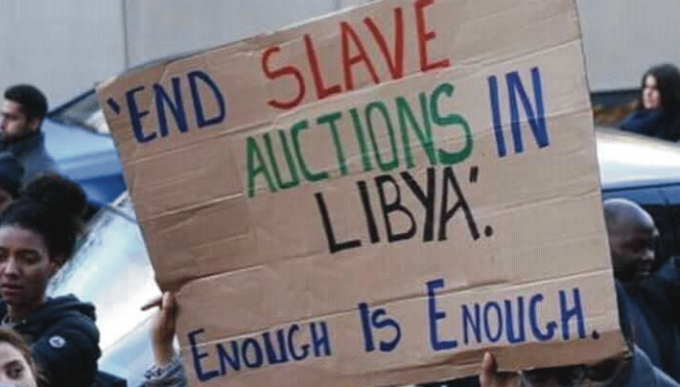 The Libyan slave trade has been known to be in operation for years. It accompanies the brutal exploitation of those fleeing poverty in Sudan, Chad and Nigeria. It is well illustrated by the story of Victor Imasuen, the young Nigerian interviewed by US broadcaster CNN on his return to Nigeria, a video that subsequently went viral. Read more about Stop this slave trade! At the end of July, when France and Italy were about to sign a deal sealing the grip of Italy’s largest and most profitable company, Fincantiere, on France’s massive shipbuilding industry, Macron upset the applecart by announcing the suspension of the business agreement. Macron claimed it was to protect French jobs: but it was clearly a move to reassert French control over one of the country’s most strategically important companies. In the last issue we carried a piece on ever-growing xenophobia and racism across Italy, highlighting the launch of a ship by a gang of neo-fascists dedicated to “Defend Europe” by physically confronting the humanitarian NGO ships involved in rescuing refugees off the coast of Libya. On both sides of that ship were emblazoned the words — “No way, you will not make Europe home, no way”. Is Corbyn right on terrorism? Read more about Is Corbyn right on terrorism?